Location: Isle of Skye, Highland, Scotland. Notes: Caisteal Maol (Gaelic: Caisteal, 'Castle', Maol, 'bare') is a ruined castle located near the harbour of the village of Kyleakin, Isle of Skye, Scotland. It is also known as Castle Moil, Castle Maol, Dun Akyn, Dunakin Castle Dun Haakon and Castle Dunakin. 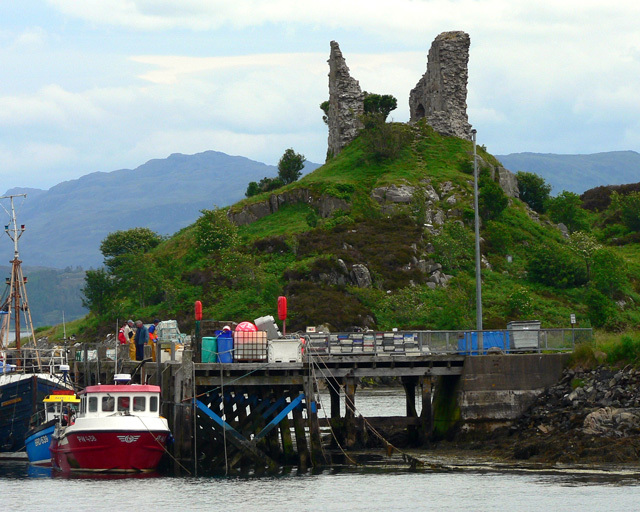 The castle occupies a headland above the village of Kyleakin facing the village of Kyle of Lochalsh across the strait. It is a simple rectangular keep of three stories. The unexplored basement level is filled with rubble and other debris and is believed to have contained the kitchen. The visitor today enters on the main level where the public dining space would have been. Stairs would have led up to the private apartments above. The castle is nearly completely ruined. In 1949 and 1989 parts of the ruins broke away in storms. The remaining ruins have been secured to prevent further deterioration. No excavation of the ruins has been carried out, or is planned.